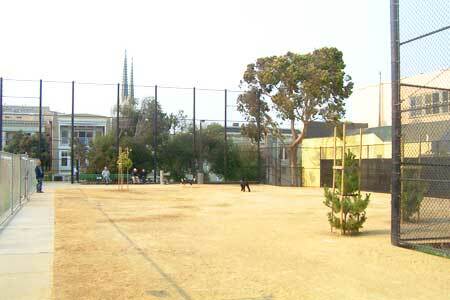 Friends of the Noe Valley Rec Center is a non-profit advocate for Upper Noe Recreation Center. We maintain a website, host free public events, purchase equipment and supplies, produce a monthly newsletter, and organize regular volunteer gardening days. We meet on the third Wednesday of the month at 7 p.m. with the Upper Noe Recreation Council .Learn more and get involved! Be a Friend. Get the benefits. Help decide programming priorities at Upper Noe Recreation Center by serving a two-year term on its Recreation Council. The council meets monthly. Please fill out this form and return it to Facility Coordinator Cheryl Woltjen by hand or by mailing it to 295 Day Street, SF, CA 94131. The Upper Noe Dog Play Area (DPA) was dedicated as Joby’s Run in 2008 following extensive renovation that improved access, added trees and plantings, and upgraded the surface material for better drainage. The FNVRC Dog Run Subcommittee is responsible for frequent inspection of Joby’s Run, noting conditions and community input, reporting to Rec & Park and FNVRC, and interfacing with Friends of Upper Noe Dog Owners Group (FUNDOG) which has direct stewardship responsibility for care of this DPA. Please email dogs@noevalleyreccenter.com if you have questions or concerns about the dog run, or call 311 to report problems with conditions or behavior.